After Europe watched on in astonishment at two days of riots and ‘migrant hunts’ in the eastern German city of Chemnitz (see our related coverage), some 600 Antifa demonstrators and 80 members of far-right groups staged rival demos in the major west German city of Cologne. Around 600 Antifa demonstrators and 80 members of far-right groups staged rival demos in the major west German city of Cologne, after right-wing riots in Chemnitz which scandalized Germany. Both groups congregated in Breslauer Platz and were separated by a heavy police presence. The protesters could be heard chanting slogans and holding banners. Police reported no major incidents barring slight provocations from both sides. The Cologne rallies were held in response to right-wing riots in the east German city of Chemnitz. Those incidents were, as we’ve informed you, sparked by the killing of a 35-year-old German man in a dispute in the early hours of Sunday morning, following a fight at a city festival. Two male suspects, aged 22 and 23 respectively, refugees from Iraq and Syria, have since been arrested. 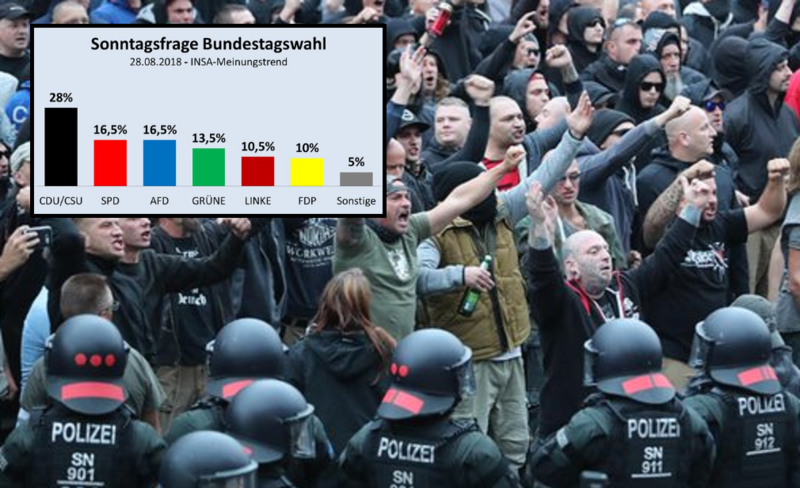 Meanwhile, political polls show that the anti-immigrant AfD is rising in public opinion, putting them now level to the second biggest party in the country. Should elections be held today and this opinion poll ring true, Ms. Merkel would be out of power. Germany has regional elections in October of this year. I think this is exactly the type of behavior and response the German and E U elites want and expect from their current immigration policy. Justification for guber mente authoritarian Crack down and control is what they want. Publish the countries and E U leadership names and addresses. See how the direction and tune changes. Don't worry krauts, the Jews are gonna be sure to put you back to your place and always be subservient, and never make you forget.